Scarecrow Pr, 1990-04-01. Hardcover. Very Good. Very good hardcover. No DJ. Text is clean and unmarked. Covers show very minor shelf wear. Bindings tight, hinges strong. Ex-Library with usual markings. ; 100% Satisfaction Guaranteed! Ships same or next business day! Madison: University of Wisconsin Press, 1963. hardcover. near fine/good. 225pp. Tall 8vo, yellow cloth, worn and discolored d.w. Madison: Univ. of Wisconsin Press, 1963. A near fine copy in a good dust wrapper. University of Wisconsin Press. Used - Good. Good condition. Good dust jacket. 2nd edition. Owner's name on inside. Scarecrow Pr, 1990-04. Paperback. Good. Wisconsin: Univ. Of Wisconsin, 1963. Hardcover. Near Fine/Very Good. First edition. Near fine in very good plus dustwrapper. Dustwrapper price clipped. Edges of spine lightly bumped. Dustwrapper slightly shelf rubbed. Otherwise nice condition. Please Note: This book has been transferred to Between the Covers from another database and might not be described to our usual standards. Please inquire for more detailed condition information. Madison, Wisconsin: University of Wisconsin Press, 1963. First Edition First Printing . Hardcover. Near Fine/Near Fine. 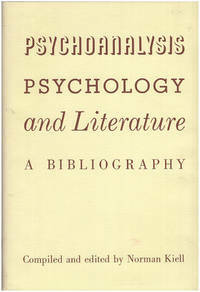 Compendium of 4400+ titles of articles, books, & monographs published 1900-1961 that apply a psychological perspective to works of literature or literary characters. A In 225 pages with Subject Index. A FIRST EDITION from 1963, this hardcover with mustard-colored cloth over board is in Near Fine condition: completely clean, binding straight & secure, pages white with mild tanning around edges only. Aside from 3 marginal pen marks on pages 90-91, there is NO writing/underlining/highlighting; NOT ex-lib or BCE. Price-clipped DJ is also Near Fine, with very minor rubbing; nicely protected in Free archival mylar cover before shipping. Please see our photos! Description & photos copyright Gargoyle Books 2017. Same Day Shipping on all orders received before 2 pm Weekdays (Pacific time), Weekends & holidays ship next business day.Free upgrade to First Class shipping from standard on this book! The University of Wisconsin Press, 1963. First Edition. Hardcover. Very Good/very good. Unmarked text. A few smudges on dust jacket. 224p. Topics autobiography, biography, comics, drama, fairly tales, fiction, films, folklore, journalism, poetry humor, and more. Includes over 4400 titles of articles, books, and monographs written during the period 1900 through 1961. Index. Measures 6.75x9.75 inches. University of Wisconsin Press. Used - Very Good. Hardcover w / dustjacket. Near Fine condition book in priceclipped dj; edges, corners, and covers of book show very minor wear. No underlining; no highlighting; no internal markings. No pricing stickers. No remainder mark. DJ is vg with edgewear and priceclip. Stored in sealed plastic protection. In the event of a problem we guarantee full refund. 1963. Hardcover w / dustjacket. Madison WI, The University of Wisconsin Press, 1963, hardcover, 225 pp, first edition, Very Good in Fair dustjacket. Straight, tight and clean with no markings, spine end and corner wear, bookplate on front pastedown. Dustjacket unclipped with original price, light edge nicks, rubs, spine darkened, sticker ghost on front panel, in new Brodart sleeve. The compiler has included over 4400 titles of articles, books and monographs appearing in the period 1900-1961, dealing with literary writings from a psychological point of view. Appended list of abbreviations and journals, subject index. University of Wisconsin Press, 1963. Price clipped from jacket flap; previous owner's name to first blank page.. Hard Cover. Very Good/Very Good. Madison: University of Wisconsin, 1963. First edition. Very good condition in a very good dust jacket.. Condition: Very good condition in a very good dust jacket. University of Wisconsin Press. Used - Good. Former Library book. Shows some signs of wear, and may have some markings on the inside. Scarecrow Pr. Used - Very Good. Former Library book. Great condition for a used book! Minimal wear. Scarecrow Pr. Used - Like New. Ships from Reno, NV. Book in almost Brand New condition. 100% Money Back Guarantee. Shipped to over one million happy customers. Your purchase benefits world literacy! University of Wisconsin Press. Used - Very Good. Very Good condition. Good dust jacket. University of Wisconsin Press, 1963-01-01. Hardcover. Very Good.